There's nothing better for a guitar player than to have a new piece of music. It can make all of the old music fresh again. 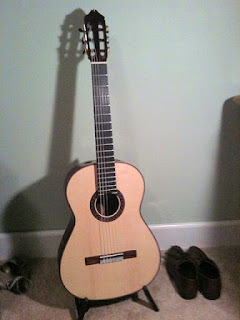 And there is nothing better for a guitar maker than to have an new wonderful guitar. Today I have both. 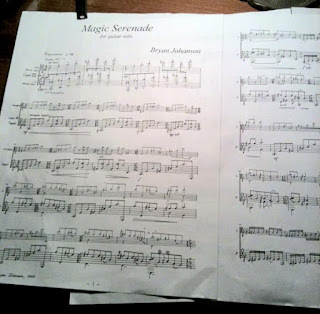 In September I heard William Kannengeiser play the Magic Serenade by Bryan Johanson in concert. I fell head over heels for the piece in the audience, and asked Bill about it backstage. He told me to contact Bryan and ask for it. It worked! Within very little time, amazingly, thanks to Bryan Johanson, a photocopy of the score arrived by mail, and now I can play it, sort of anyway. I say sort of, because Bill played it so beautifully, perfectly, and I'm still learning the piece. But the music is so delightful that I can hardly lose. It IS magic, not exactly supernatural like Harry Potter or Jesus, but like delightful parlor tricks, using household objects to amaze, pulling an egg our of an ear, a hundred yards of scarf out of a thimble, sawing a beautiful melody in half and putting it back together, with no consequences. This month I also made a new guitar. It is a variation on an older but evolving theme - a Hill Signature Guitar, now with a lattice braced top. I have long made the soundboard as a double top with both spruce and cedar as the two outer and inner woods. Over the last few months I have been making the same guitar, but with lattice bracing, changing the shape and dimensions of the lattice, but always using cedar for the braces, to mitigate the possible edginess of the sound. Now I have also gone to using both spruce and cedar to make the lattice, and I'm just now starting to hear the results. Fantastic!! This guitar is a joy to play. It does everything. And the crazy thing, I'm grinding my head, thinking of how to make it better! I guess you'll have to hear it for yourself. I'll be playing this guitar, plus the Magic Serenade, plus other old but very happy pieces on Friday night. The fact, is, I have to practice! Nevertheless, this is a rare moment, new music, and a new guitar. Maybe as good as it gets. I hope I play OK on Friday. New video postings from Hill Signature player Scott Morris' YMT Guitar Trio got our attention today. Here's a link to a their pages. We add information about Hill Guitar players in the PLAYERS section of the website from time to time. Fans of "other-worldly" acoustic guitar play will want to keep your eyes and ears peeled for the new & innovative, Los Angeles bred YMT GUITAR TRIO. 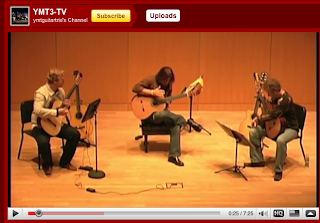 The YMT Guitar Trio is a collaboration of guitarists Jeff Young, Scott Morris and Steven Thachuk. Each member brings years of diverse musical experience to the group. Performing music as varied as their individual backgrounds, their repertoire includes original works as well as Brazilian, Miles Davis, Michael Jackson, Radiohead, Zappa & Led Zeppelin - to name a few. Their debut concert tour takes them to venues and festivals throughout Europe and the United States beginning July 2009. Y: Jeff Young was the lead guitarist for Megadeth from 1986-1988, performing on and touring for the multi-platinum album So Far, So Good... So What! He toured with, recorded and produced Badi Assad from 1996-2000. Their recording Chameleon went to number one in Europe and topped the JAZZIZ Readers Poll for "Best Brazilian Album." Jeff also served on the teaching staff at Musician's Institute/GIT in Hollywood, California. M: Scott Morris gave his New York recital debut at Carnegie Hall in 1998 and has appeared as a soloist throughout North America, Europe and Asia. He has recorded for Eroica Classical and Centaur Records, working with longtime Neil Young producer Niko Bolas. He has also performed and recorded with artists as diverse as Steve Perry (ex-Journey) and Martin Chalifour (LA Phil Concertmaster). T: Steven Thachuk is known as one of Canadas most outstanding and versatile guitarists consistently challenging the nature of the instruments repertoire and boundaries. Playing both traditional classical guitar and a steel string instrument he has appeared in recital, as a chamber musician, and soloist with orchestra throughout North America, Great Britain and Europe.